If you would like an intimate retreat or vacation that includes yoga, Tribal Tulum's personal retreat itinerary is right for you. Here, you can enjoy small classes and allow yourself to build the day honoring how you feel. The location also lets you explore the authentic Mexican Tulum Pueblo and the area's mystical Mayan archaeological sites and the magnificent Tulum Beach. You will have a cozy stay in the fabulous, private loft style apartment. It has a full bath, king sized bed, fridge, kitchenette with coffee maker, air conditioning, and Wi-Fi. Lofts 1, 2, and 4 also have private balconies with hammocks and a gas stove in the kitchenette. The lofts are on the bike path that joins Tulum Pueblo to the Tulum Beach. Spacious and luminous, they are just in the right spot to connect the beach and town. There is an energy in Tulum that inspires the yoga and the people who visit to practice. With a rich Mayan history and presence, Tulum seems to vibrate on a higher frequency than most places on Earth. Whether on the beach, in the pueblo, or in your yoga practice, you will be moved to be more fully yourself and to explore areas you have yet to understand about yourself. This à la carte retreat allows you to shape your day respecting yourself and your energy levels. 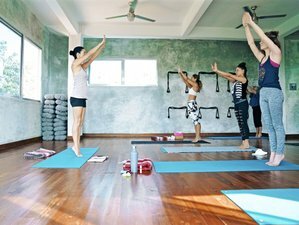 Tribal Yoga Tulum are here to help you plan your days around the yoga schedule, book a dive with a partner dive shop and assist you in coordinating tours and adventures. Upon arrival, you will be able to retreat and relax. Please send an inquiry for more details on the program and schedule. Your loft apartment is on the bike path that joins Tulum Beach and Tulum Pueblo. It is a short distance from some of the area's amazing cenotes, underwater caves, and Mayan ruins. You can access tours that lead you to all of these as well as jungle adventures and amazing nature reserves and areas. The lofts have a kitchenette where you can have the flexibility to cook your own meals or you can simply ask for catered meals at an additional cost. Just steps away, there are a wide range of food options available to you within walking distance of your accommodations. You can also choose to explore one of the several renowned restaurants in Tulum Pueblo or along the Beach Road.